wheremmsgather: Wild Thing You Make My Heart Sing! Hi!!! My name is Zany Zach, and I'm hookin' up with a bunch of other wild rockers at the Zeke, Zena and the Zebroids rock concert in Africa today as hosted by da Muddermark and her weekly Teapot Tuesday gigs. I'm wearin' the requested black and white that Mr. & Mrs. Zebralski (Zeke's parents) asked da Muddermark have her tea partiers wear to help their son "conform". It seems like Zeke wants to stand out in a crowd and come up with his own rock star trademark look by wearing red and black stripes like David Lee Roth. I don't know why his parents can't chill out a bit and let him be his own dude in his own band, but I want to make sure I get on the plane to Africa okay by wearing the requested outfit. Don't I look very classy with my striped bow tie and music-themed body tatooing? However, I hafta to tell ya that I'm like any typical teenager and have a few costume changes of my own in my bag. I'm just a little scrapling made mostly out of punches (various sized circles, scalloped corner, ovals, large and small star punches for forehead and nose, boho blossoms for feet), with a dry-embossed musical-themed body, and I only stand 4 1/4" tall by 1 1/4" wide. My creator plans to use me as a bookmark since she loves penguins and loves to read. That sure is gonna hurt my feet when she closes the book. Ouch! If you'd like to play in Mothermark's Teapot Tuesday challenge, you can check out the details here. You are incredible! What a fantastic creation! Have fun at the party!! thanks Charlene. S2G Halloween stamps are being released on Thursday with a blog hop. And they are a hoot! Lots of prizes, too! So stop back and I hope you win!! LOL...this is fabulous....obviously he is wearing his suncreen! Love it Charlene, did you come up with this by yourself?? I think it is so creative no matter, and glad you made it to the party. Me, I'm just getting back into the groove of things at home...maybe next week! ooooooooh i want the first dance with this cutie! wild thing! you make my thing swing! ooops! wrong song! Bwwwaaahhhaaaahhhhaaa! Oh Charlene this is the cutest!!! This is just too cute. I will have to make these for my reading class. 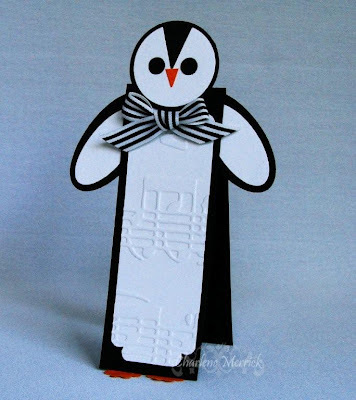 This is just the cutest little penguin EVAH....I love him, Charlene!!!!!!!!! He will be such a hit at the party, too...just be sure to keep him on ice!!! Hi Charlene!! Love what you did here... Looking forward to seeing your creations this month for STamp Simply!! This is too sweet Charlene!!! Love that Penguin!! So creative and fun!! You are amazing Charlene!! Oh, how darling and creative is this!! Makes me smile! Now isn't this just a charming little guy! Too too cute! I had so much fun when you posted this for the challenge! It is so clever...you rocked that challenge. Giggle...oh and by the way, its so YOU!! Didn't realise at first this was a teapot card - can't claim jetlag as an excuse, I should have guessed. Do you get Penguin books over there, they used to be one of the BIG paperback publishers here before there were so many, so a penguin bookmark seems extra appropriate to me. In the early days they even used to number their books - the very early ones were usually orange, with the title and a number on the back, and a penguin, of course. And crime is green - plenty of that on our shelves :D.
I just love his fancy bow and musical reference.